Now that McDonald’s offers all-day breakfast, the brand’s addressing the new No. 1 customer request: making its packaging more environmentally friendly and offering recycling at all of its restaurants. “We have a responsibility to use our scale for good to make changes that will have a meaningful impact across the globe,” Francesca DeBiase, McDonald’s chief supply chain and sustainability officer, told Reuters. However, this new eco-friendly push won’t happen overnight. McDonald’s is giving itself until 2025 to make 100% of its packaging come from renewable, recycled or certified sources, and offer recycling at all of its restaurants. Currently, only half of its packaging comes from eco-friendly sources, and 10% of its restaurants have recycling bins. 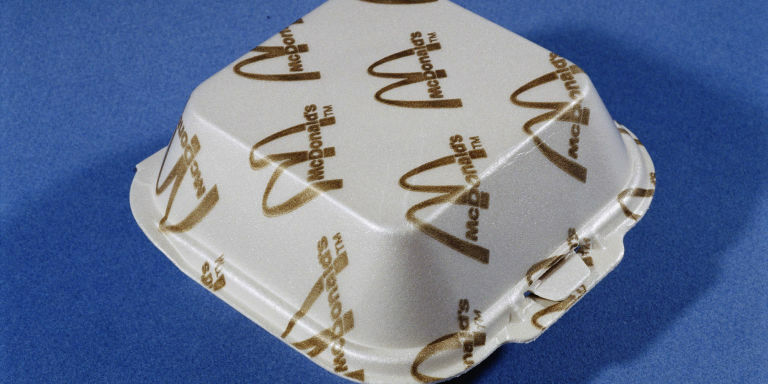 McDonald’s stopped using these eco-unfriendly clamshells three decades ago and will finally eliminate styrofoam cups at their restaurants by the end of 2018. This news comes a week after McDonald’s also promised to stop using plastic foam cups at their restaurants by the end of 2018. While McDonald’s stopped using styrofoam clamshells for its burgers nearly 27 years ago, they’ve continued to use polystyrene cups, which are virtually impossible to recycle, in a few locations. Even though the cups account for only two percent of the company’s packaging, that number still equals millions of cups each year, according to the Chicago Tribune.